When I was a new (and still naïve) shelter volunteer I arrived one day before the shelter had opened. There was a woman standing outside with her dog. Despite her family’s efforts, her dog was still eliminating indoors, so she was waiting to surrender him to the shelter. You may find that shocking, or maybe you have been at the end of your rope and can identify with the woman’s desperation. Since then I’ve met people of all ages and walks of life who have done the same, or who have been close to severing their ties with their dog due to this problem. Fortunately this is not Downton Abbey so I can just come right out and say it: peeing feels good. Each time your dog eliminates, it is internally and powerfully rewarding. If you’ve ever been on a long car trip and then finally reached a rest area, if you’re anything like me I’ll bet you are practically skipping through the tulips after you’ve used the facilities. Eliminating feels good to your puppy, so he or she will learn whatever behavior patterns precede the potty opportunity. –If your pup pees indoors (in the crate or the hallway), that will feel good and he’ll be more likely to do that again. Instead: Take your pup out every 30-45 minutes, on leash, silently, and reward right then and there with a treat, some playtime and/or a walk. (Clean up indoor messes with an enzymatic cleaner.) Supervise like a hawk between potty times. Use the magic chart. –If your pup goofs around off-leash outdoors and then pees indoors when you get back inside, that will feel good and he’ll be more likely to do that again. Instead: Using the leash, pace in a 10-foot area, and if no results after a few minutes come back inside (for confinement or tethering, not for play). Try again in 5 minutes, then play with him after he goes as a reward. Your pup will learn that the sooner he does his business outside, the sooner the fun begins. 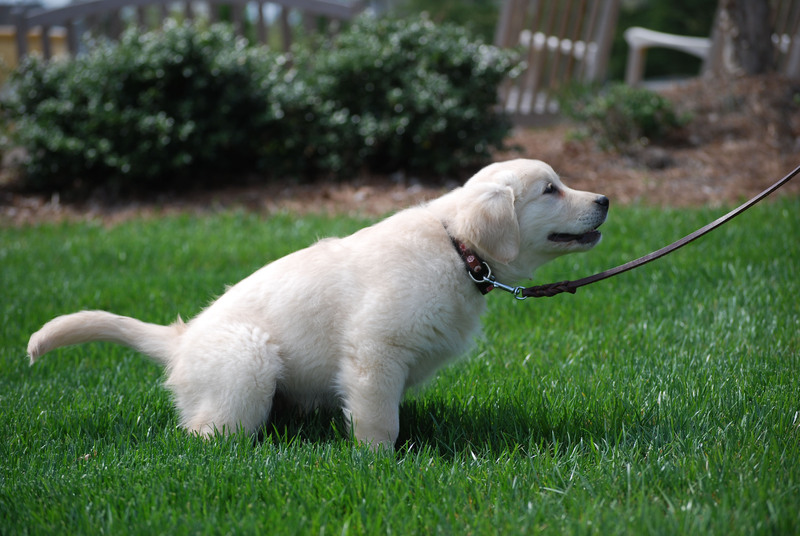 –If your pup pees in front of you indoors, and you ignore the behavior and wait for him to finish (some trainers recommend this), you are teaching him that peeing indoors is rewarding (remember, it feels good). Instead: Interrupt him. Don’t freak out, frighten or scold him; if you scare him he might not eliminate in front of you outdoors (gack! ), plus he’s just answering nature’s call—he’s not being “bad.” Just gasp or clap once and then whisk him outside. Reward as usual. Peeing is rewarding, so try to make sure it happens only outdoors. Treats, running, exploring, playtime with you, a walk, freedom from confinement…all of these are rewarding, too. Make sure they follow only outdoor elimination, and you will be on your way to training a lifesaving habit. Still stuck? I welcome your questions below. Try the Puppy Savvy Housetraining Chart. For simple and effective housetraining advice, the correct way to put elimination on cue, troubleshooting and FAQ’s see Puppy Savvy.